DEBORAH CROMBIE: On Friday, a friend I hadn't seen since before my trip to England in September asked me what was the highlight of my trip. I was speechless. Life has been so hectic in the month since I flew back from London that I haven't even had time to process everything I did. But I kept thinking about the question, and this photo was what kept coming to mind. So I share with you the view of the apple trees in the garden at Lords of the Manor, in Upper Slaughter, Gloucestershire, for a little Sunday meditation. Happy Sunday, and I hope that your day is as peaceful as this! Tell us what you're doing today to get a fresh start on the week ahead! P.S. And what is it about paths so that is so alluring? Oh, my, what a lovely, appealing picture . . . it’s truly peaceful. The path really draws you in and, coupled with the hedges all around, it makes me think of wandering through a labyrinth. What am I doing to get a fresh start on the week ahead? Filling my shoeboxes for Operation Christmas Child and then catching up on my reading. I realize that none of that is likely to give me a fresh start for the coming week, but it’s going to make me happy, so it must be a worthwhile way to start the week . . . . Going out to breakfast at the Irish Cottage. Maybe that will help adjust as we change the clocks. That is a truly lovely picture. Thank you for sharing it! I'll be heading over for an hour of silent unprogrammed worship with Friends this morning. Then a walk at a town park/farm with bluebirds and many miles of paths (where we had our first date), followed by my delayed birthday lunch at one of our favorite restaurants. What Joan said: it might not get me ready for the week, but all of it will make me happy. And that's enough. I so loved England when I visited in 2010. Paths in themselves are enjoyables by their differences and there is also the pleasure to discover what it leads to. On this cold and rainy day in Quebec, I'm reading a signed book I received at Bouchercon : A Good Day To Buy by Sherry Harris. Enjoying a peaceful day will help me to face a hectic week. This reminds me of a photo my daughter took when she was in Mexico, of a narrow pier/walkway extending out into the ocean with a half-closed gate at the far-far end... Other end of the world and different color palette, but a photo rife with possibilities. Maybe after the word slough? Is it near a bog or wetland? People from Schoharie, NY have be called "sloughters" for years. If I ever knew why I have forgotten it now. So I just did a google search and came up with some very interesting, if insulting, explanations. Isn't that "Sloughter" a family name? Oh how I love English place names! Deb, what a lovely picture. I love paths, and my screensaver picture on my phone proves it -- as a path in the woods where I hike a lot, with a bower of trees over it. Not as nice as yours, but to me, enticing and pleasing, with dappled sunlight through the trees. I'll be attending a used book sale today and then doing some hiking if the weather holds up. Happy Sunday, everyone, and may all your paths lead to good places! I wish I could say that I had something interesting or relaxing to do today, but it's a laundry and cleaning day. Although that does get me ready for the week, I guess. Today is catch up day so I'm working hard on my unfinished projects and have a slow cooker stew planned for supper with some fresh rosemary bread from the bakery. Enjoy the day all! That sounds like a good day to me! What's in your stew, Kait? Always looking for good slow cooker recipes. Lovely picture Deb, and yes, Hallie, Upper Slaughter. My own favorite English village names are Nether Wallop, Middle Wallop and Over Wallop. Miss Marple, the PBS version, was filmed in Nether Wallop. Fresh start on my week? I'm going to walk the dogs, come back and have a hearty breakfast, get the physical therapy exercises out of the way before noon, and then get our David to work on cleaning up the gardens for the winter. Somewhere in there I hope to get to Mass, but no guarantees. I still look like a victim of domestic violence after that "minor" eyelid surgery on Thursday. I wish I could say I'd had the droopy lids lifted but it was more in the way of lesions removal. No, it was NOT a wart dammit. Go with the wart, Ann, and claim some hag cred! I was glad to hear it was feeling better today. Ann, I love the Wallops, too. There are wonderful place names all over England, but you can't beat the Cotswolds. There's a village not far from the Slaughters called Guiting Power. 'Splain that one! Did anyone else notice the white rabbit with a clock hiding behind the farthest hedge? Beautiful, and wondering where are the Ladies of said Manor? Today will be spent with my virtual sangha then I will be writing a request for funding for my new hearing aids. The cost is above my budget; I hope my company's employee assistant program will help. I am taking the hour we just got back to snuggle with a cat + Body on the Bayou. Cleaning? tomorrow and tomorrow and tomorrow. Paths, and gateways, too, are glimpses into the next way, or the next view. They are ripe with possibility. Today I will walk the property where we'll be building our home next year with a horticulturist friend. He works at the Cincinnati Zoo and Botanical Gardens, where the collection of plants is as impressive as the collection of animals, and he will advise me on which trees are worth avoiding as we plan the construction. There's an impressive oak tree that is way too close to the existing house, which was built in 1940. I just found a photo, dated 1959, of that tree, which even then was massive. I hope we can both save it, and find a way of building around it. And I want to create garden and landscaping space that has some of the same mystery that your path photo has, Debs. It's a challenge, for sure. Karen, I agree about the glimpses into the next way, or the next view. And of course there is just good old artistic composition, the drawing of the eye into the picture, but I think there is an additional mystic element. I have a "garden path" page on Pinterest--it's a good way to collect ideas. And of course you must make the best use of your old trees. Such an exciting project. I hope you'll keep us posted! I like this photo so much I would be tempted to print and frame it, but I have nowhere to put it unless I take something else down! Yes! The vanishing point of perspective. Thanks, I've been struggling to remember that, Debs. Darn leaky brain. I'm going to be spending my "extra hour Sunday" doing some laundry, doing a little organizing work on my upstairs office, making yogurt in my slow cooker (2nd time a charm, I hope) writing, and hopefully finishing THE GATEKEEPER by Charles Todd! It's very muggy, warm, and windy here in north Texas and the leaves are falling thick and fast. Cold weather coming by mid week. The Gatekeeper? Is that a new one? Bess or Rutledge? It's the new Rutledge, which I think is not out until February. I was lucky enough to snag an ARC at Bouchercon. It's so good. I only have about fifty pages to go and am dying to finish it! It's funny...I got focused on the wrong end of your question. I had wanted to visit England since I was a teenager and didn't get to go until I was about 62. We arrived at Heathrow bleary eyed from an overnight flight, hideously jet lagged and after we located our departure point for our hotel shuttle, we found a bench to sit on and collapsed. This was before Heathrow finished their renovation...the floor was grimy old tile, there was construction mess all around us and it was raining outside. And Heathrow isn't exactly situated in the "scenic" part of town...my friend looked over at me and asked "Why are you smiling?" I looked at her and replied "I'm in England". It was enough. I don't know that it really counts as getting a fresh start on the week ahead but this morning when I got up I set about listening to one of the albums I bought as part of a big lot purchase I made from a friend's record shop. I write a series called The Cassette Chronicles for an online music magazine and once I finished listening to the album I wrote about it for this coming week's installment. After spending the daylight hours yesterday mostly involved in household chores, it is always nice to be able to spend some time with my various hobbies or writing endeavors to just chill out and relax. Oh, and I ended up watching one of those interminable holiday movies on the Hallmark Mysteries and Movies channel. But it co-starred Jewel Staite and anything with a former cast member of the TV show Firefly in it is AOK with me. I'll spend some time reading later this afternoon before deciding on what to do for dinner and then wind down the day with some TV and football. I know it's not the kind of relaxation most here would choose or write about but I enjoy these kind of lazy days where I don't have to do anything, go anywhere or truthfully have to interact with people in a real world setting. Ah, the magic of a path -- the hint of something interesting ahead, the unknown, the mysterious, the delightful. This picture captures all that beautifully! Me, I'm planning to do as little as possible! Just sent in a ms. yesterday, and while my office needs excavating, my brain needs a rest. Thanks for the inspiration. I'm drinking coffee, checking email, and I reset the clocks a while ago. Next up, going out to the senior community and fetching Mom some brunch so she'll have something to eat today. Later, when I get back, I hope to veg uninterrupted. I have books to read and shows to watch tonight. Too many. Why do they cram everything in on Sunday night? Tomorrow I have to search for a health insurance plan for little brother. I will probably need to self-medicate after that. Oh, what a relaxing photo! Today started as usual with church, followed by breakfast with church friends, followed by grocery shopping. I'm vegging out now that the groceries have been put away. After lunch, a friend and I are going to a concert at our local library. To me that's a perfect way to relax on a Sunday afternoon. For years it was necessary for me to run around on Sunday afternoons. For the most part, I now enjoy the unstructured time. Happy Sunday and Happy week ahead to all of you! Oh, that's lovely, Debs. Not much meditation here - deadline!!! But your picture brought me joy so thank you for that. Today was all about church -- I teach Sunday School, a small class ages 4 to 10, and today we celebrated All Saints. We also had a Baptism. It was just a beautiful joyful morning. This afternoon I am going to R J Julia to hear Isabelle Allende!!! Debs, that is such a beautiful, peaceful photograph. Paths are so full of promise, of unexpected discoveries. I especially love paths and pictures of paths leading to the open countryside, where nature astounds us in our magical meanderings. I don't plan on doing much today. I have a few more Halloween decorations to tuck away, but I'll probably do some playing around online and then read. We're due a storm tonight, and I'm hoping it doesn't interfere with watching Outlander and The Walking Dead. I exercised, have been working on the book, and plan on some relaxation this afternoon. Maybe a nap and/or an episode of "Vera"? Sounds like a perfect Sunday to me! And the Patriots have a bye this week, so no football on the docket. Sunday is not my day to relax - up early to get Mom ready and off we go to Sunday School. I enjoy teaching a class and then attending worship service. We usually grab something to eat home or once in a while go out to eat with family. I enjoy catching up on Facebook for a few minutes, then time for the "Baptist Nap" before I head back to church to work with our Awana groups. After spring break we take Sunday afternoons off until school starts up again and I mostly enjoy relaxing those afternoons reading a book or watching a little NASCAR. Sunday is when I take the time to smell the roses, in other words, try to relax. The beautiful photo reminded me of my travels to England. I love the gardens there. So beautiful. The paths can led you to new discoveries. Today is the book sale at my local library and I am hoping that they will have some new books that are NOT old and dusty. The older books have a certain smell if they are not well cared for. I had to give a speech this morning--but it was fun, and people bought a lot of books. Then we had errands, then we came home, then I did laundry, and now I am writing! well, now I'm here, in truth, but I l will be writing in a minute. Or trying to. So this is a work day! I'll make rack of lamb for dinner, yum, to make up for all the working. And then we can watch Outlander! Debs, that is gorgeous! And I am ragingly envious that you have the new Rutledge. And I adore reading about what you all are doing! I just got home from the first rehearsal for our next concert, which will feature one of the most beautiful contemporary symphonies I've ever heard: David Maslanka's Symphony No. 4. Which is, I suppose, a pretty fine way to spend the day, if you have to go out and work. 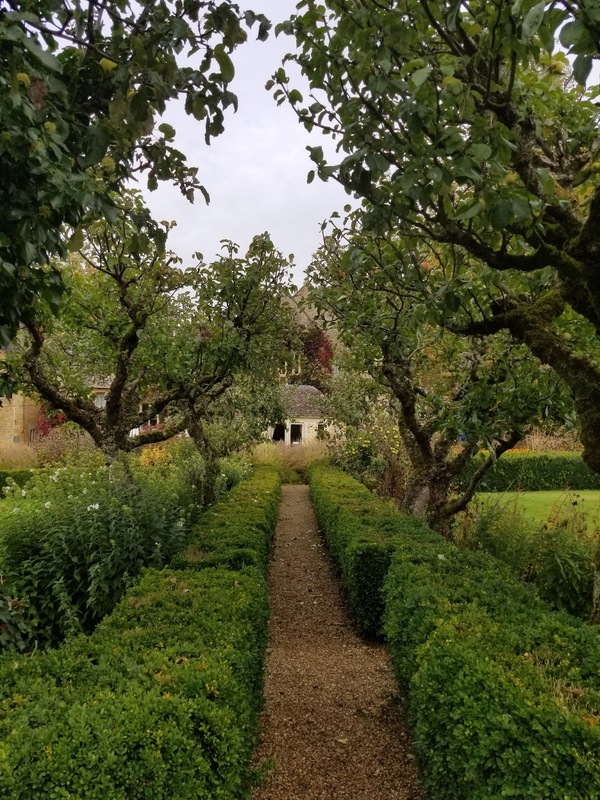 To be honest, though, I think I would have preferred to wander down Deb's garden path, or any interesting byway around Upper or Lower Slaughter. Maybe next year.